This is part 4 of my couch slipcover tutorial. Go here to start from the beginning. Cut a rectangle of fabric & pin it to one of the arms. Outline the existing piping in chalk. Cut out the arm piece, leaving a little around the edge for seam allowance. Use the arm piece as a template to cut out your second arm front piece. The chalk will transfer to the second piece, which is okay because the chalk is useful in the next step. It also helps to remind you to make two mirror image arm fronts instead of two that are identical. Pin your piping onto the arm fronts, raw edges facing outward. Line it up with the chalk as you pin. You may need to cut some small slits along the curved edges like I did. Sew on the piping & check the size of the arm front against the arm of the couch. 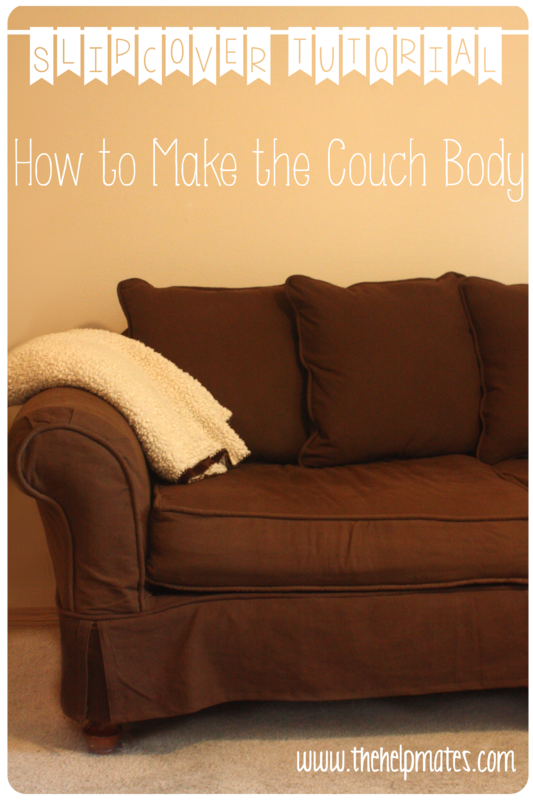 Pin it to fit your couch arm & trim it down to size. Pin the arm front piece on inside out. Since my couch originally had several pleats along the top of the arm, I added some in as I pinned the arm front piece to the rest of the arm. Sew, turn right side out, & put it on the arm to check sizing. Make adjustments if needed, & if everything fits fine then repeat for the other arm & move on to the next step. Put the finished arm pieces on the couch inside out. Drape a large piece of fabric from the top of the back of the couch down to the front edge. Pin the body piece to the arm pieces, stretching the fabric tight across the body of the couch. I went ahead & chalked the edges to help myself know where to sew. Sew the three pieces together, turn it all right side out, & fit it onto your couch. Make any needed adjustments. Now, pin another large piece of fabric to the back of your slipcover – again, inside out. I chalked along the top of the back, around the arms, & down the sides, but only sewed across the back & the top of the arms. If you sew any more than that, you won’t be able to fit the slipcover onto the couch without ripping some seams. Turn everything right side out & put it on the couch again to check the fit. If everything looks good, then you’re ready for the next tutorial – the skirt. Check back next Friday for the next tutorial! Please it am trying to do the slipcover tutorial and can’t find your “Part 2” for the skirt. Can you send me a link, please! Thank you. Great tutorial I am taking on my camel back sofa.